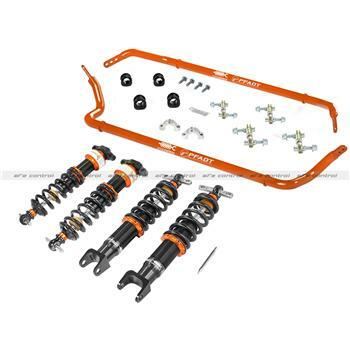 aFe PFADT Suspension Package - Stage 2 FORD - Lightning Motorsports - Selling Speed since 1996 ! aFe Control is proud to introduce the Johnny O’Connell Stage 2 Package for the 1997-2013 Chevrolet C5/C6 Corvette. Tuned by legendary 4 time Le Mans winner Johnny O’Connell, this package features sway bars and adjustable coilovers designed to provide your Corvette with racecar level road holding ability. The single adjustable coilovers are aggressively tuned making it a excellent choice for Corvettes that will be driven on the track or are looking for that extra edge. Both ride height and damping are easily adjustable in this design allowing for fine tuning your Corvette’s stance and ride quality. The coilovers are precision CNC machined from 6061-T6 Aluminum hard anodized, while the mono-tube construction utilizes a floating piston to separate the oil and nitrogen gas, allowing for predictable handling, and a consistent feel. The CIRC (Concentric Integrated Remote Canister) System more than triples the gas volume over a standard system and houses the BOA (Ball on Axis) upper mount, allowing full articulation of the Corvettes suspension offering a durable, quiet mounting solution without travel loss. Since the coilovers employ double digressive valve technology, the easy touch, rotary knob will adjust compression and rebound with 24 distinct settings from one device. The perfectly matched 4130 Chromoly tubular sway bars include polyurethane bushings, heavy duty end links and come in Johnny O’s signature yellow. The rear bar is 3-way adjustable, allowing for fine tuning of your corvettes balance. Perfectly matched components in the Johnny O’Connell Stage 2 Package will make for a complete transformation in your C5/C6 Corvette’s handling, offering flatter, faster cornering, and added car control.